The GRCA "Specification for the Manufacture, Curing & Testing of Glassfibre Reinforced Concrete (GRC) Products" is designed to enable architects, engineers and specifiers to specify GRC. It covers all aspects of GRC production from raw materials, through production, curing and storage to quality assurance and testing. 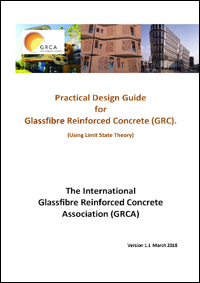 GRCA Practical Fixing Guide for Glassfibre Reinforced Concrete (GRC). GRC manufacturers may use the GRCA’s "Characteristic Value Spreadsheet" to determine the compliance of GRC test results with the GRCA Specification requirements for LOP and MOR values. 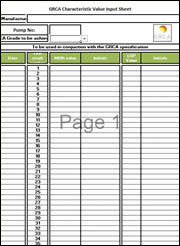 GRC test results input into the first sheet are automatically analysed and displayed on the second sheet. GRC manufacturing GRCA Members must complete and submit a "Characteristic Value Spreadsheet" on an annual basis. Today´s GRC for Architects and Engineers. Glassfibre Reinforced Concrete (GRC / GFRC) is one of the most versatile building materials available to architects and engineers. 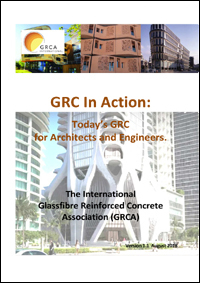 This publication from the GRCA aims is to give architects, engineers, and other construction professionals an insight into the wide range of applications of GRC currently being executed throughout the world. 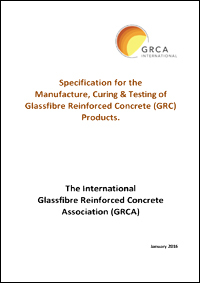 What is GRC, glassfibre reinforced concrete, also known as GFRC, glass fiber reinforced concrete? What can GRC (GFRC) be used for? Which Grades of GRC (GFRC) are best suited to particular situations? Any manufacturer displaying the GRCA “Full Member” logo (previously referred to as the GRCA AMS) has been audited by an independent certifying body appointed by the International GRCA. 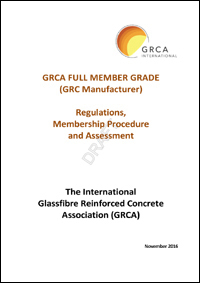 As part of the Full Member audit process the GRC manufacturer must demonstrate that they have sufficient resources in both plant, equipment and labour to manufacture high quality GRC in accordance with the "GRCA Full Member Grade, Regulations, Membership Procedure and Assessment", available here. The answers to Frequently Asked Questions (FAQ´s) about The International Glassfibre Reinforced Concrete Association (GRCA) and Glassfibre Reinforced Concrete (GRC / GFRC) are available here >>>. A Glossary of technical terms relating to GRC /GFRC is available here >>>.